Mature female white shark (Carcharodon carcharias) navigates Agulhas current, South Africa. credit: Morne Hardenberg. ABERDEEN, Scotland -- A navigational error, possibly by a few pregnant females, around 450,000 years ago during a time of global climate change, probably prompted them to take a 'wrong turn', according to research published today (Wednesday, November 17) in Proceedings of the Royal Society B. And they have stayed in the Med - although in low numbers - because like salmon they return to their place of birth. The peninsulas and narrow channels of the Med may also have made it difficult for the sharks to make their way back out. Scientists believe a combination of factors such as climatic instability, high sea levels and an unusually fast flowing eddy called an Agulhas ring, which is periodically 'spun off' the Agulhas Current - the largest western boundary current in the world, transporting more water than any other - is likely to be the reason the female sharks ended up in the Med. The Agulhas Current flows down the east coast of Africa, doubling back on itself when it reaches the South East Atlantic Ocean at the bottom of Africa. But periodically a loop or eddy called an Agulhas ring pinches off when both bodies of water meet. This ring enters the Benguela Current which flows up the west coast of Africa. Thanks to tagging and genetic analyses, scientists know sharks swim between Africa and Australia and have a natural tendency to swim east to their birthing grounds, navigating using cues from currents. But in this case researchers believe some sharks became confused. Instead of heading east towards Australia, researchers believe the sharks continued to head west, following Agulhas rings which, due to climate change at that time, would have been much more powerful than they are today. If the sharks' propensity was to head east once free of Agulhas currents then when they entered the Atlantic Ocean the west coast of Africa would have blocked their eastward movement until they got to the Straits of Gibraltar, which took them east into the Med. Swordfish and bluefin tuna may also have arrived in the Med via these unusual currents, providing the founding white shark population with fast food. The findings were made by the University of Aberdeen and scientists from Istanbul, Turkey - in collaboration with colleagues in Plymouth and America - after they analysed the DNA of four great whites caught in fisheries by-catch in the Med. Two of the sharks were caught in the Bay of Edremit off Turkey two years ago, the third was found off Tunisia in 2006 and the fourth off Sicily 20 years ago. Dr Les Noble, a shark geneticist from the University of Aberdeen's School of Biological Sciences, said: "We were absolutely astonished - it was a moment of scientific serendipity. We looked at the DNA signature of the sharks and found they were all from the same extended family. The founding mothers had the same DNA as great white sharks found off the coast of Australia." Dr Cathy Jones, also a shark geneticist from the University of Aberdeen's School of Biological Sciences, added: "We discovered that genetically Mediterranean white sharks are effectively a displaced Australian population which was probably a consequence of a historical navigational error by a few pregnant females during a time of global climate change. "Once they got to the Mediterranean they may have become trapped because its peninsulas and channels make it like a giant lobster pot. "But because white shark females return to the area where give birth, once they birth in the Mediterranean they become a fixture, shaping and rebalancing the ecosystem." Dr Chrysa Gubili, who was involved in the research as part of her PhD at the University of Aberdeen, added: "It is an incredible journey that we believe is historical and not happening now, but was prompted by a period of climatic instability. Some might say they could have entered the Med via the Suez Canal, but this apparently obvious route is unlikely because of high temperatures and hypersalinity." Now researchers are concerned for the future of the Med sharks which are believed to be low in numbers and will not be replenished by immigration from the Atlantic. Dr Noble concluded: "This is an endangered population and should be afforded protection in what is a highly polluted and overfished sea. Not attempting to conserve the remaining Mediterranean white sharks can only make things worse. "They are big fish in a small pond and are at the top of the food chain in a sea where they have moulded the ecosystem. "These white sharks are a crucial part of their marine ecosystem and look to be critically endangered. I wouldn't like to speculate on the consequences if they became extinct." Taken to its illogical conclusion, unlike so many other major seas and oceans, the Mediterranean happens to have an apex predator White shark because of a mistake, i.e., as opposed to the selective forces that press down upon the species to expand into new territories with ample resources and, of course, no White shark competition. The very premise these White sharks (or Orca, Pumas, prehistoric Humans, et al.) "mistakenly" colonized such a vast resource-rich territory to become a distinct gene pool is misplaced. It is the basic premise of gene flow. Here, through the Founder's Effect (genetic drift), the genetically distinct Med sharks likely provided valuable genetic diversity to the highly migratory, larger White shark population. A mistake? Such colonization is a means by which Evolution ensures genetic diversity via isolated "inbreeding" populations that subsequently migrate outward. That was a very interested article. 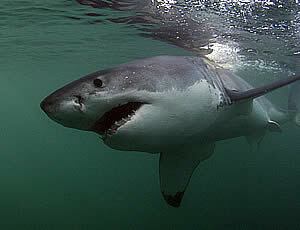 One thing that I wonder is do the Great Whites get stressed when lost, or in warmer water?